Young Jewelry Designer Among Asians Putting Their Stamp on Global Fashion Industry - Integration Through Media ....! 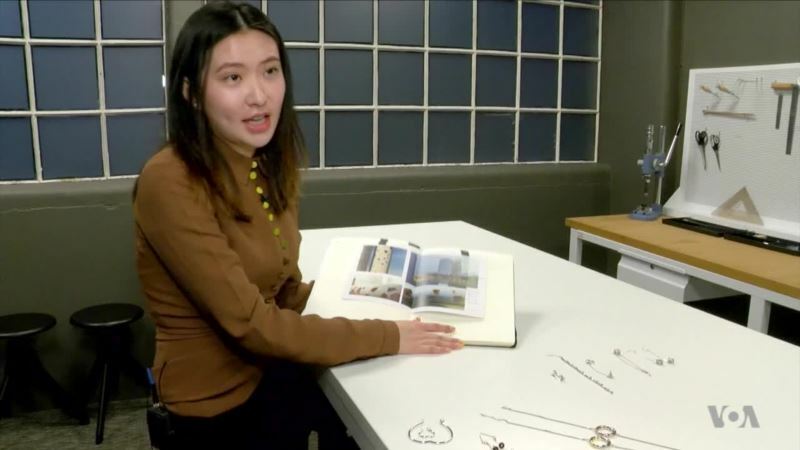 (VOA): Chinese-born Xinye Jiang sees herself as a global designer working in a global industry. And her background certainly fits that profile. Born in China's northeastern province of Harbin, Jiang went to school in London, Paris and New York, where she studied at the Parsons School of Design. Her jewelry business is also based in New York City. "My background is more oriental culture, so I feel like kind of a mix — American and Chinese, and because I studied in Europe too, I feel it's a multiple culture," Jiang says. Jiang's work fuses traditional and modern, East and West, industry and art. And for the first time, it will be modeled at the fall-winter collection showcased in this edition of London fashion week. "I really wanted to be a fashion designer, so I moved to America for study," Jiang says. "I really love something more constructive and more small, more details – so that's the reason why I became a jewelry designer." Jiang is part of a new generation of Asian and Asian-American designers who are changing the face of the fashion world. Asians and Asian Americans are increasingly putting their stamp on the global fashion industry — and the big Asian student body at top fashion schools in Paris and other fashion capitals suggests their influence will be lasting. Filipino Jason Wu — who designed former U.S. first lady Michelle Obama's inauguration gown — American Vera Wang and Malaysian Jimmy Choo are now household names among fashionistas. Chinese buy one-third of the world's luxury goods. But many of the luxury fashion brands are sill imported from the U.S., Europe and Japan — an irony for the world's biggest exporter. "[At] Parsons, it's like a lot of Chinese, Koreans studying over there," Jiang says. "And we're all doing really good. And when we stand up, [we're] going to be a big influence in the fashion world." Jiang also sees similarities between the U.S. and Chinese fashion industries. Both are modern, creative, diverse — and young.